Aromatic Summary / Note / Strength of Aroma: A middle note with a medium aroma, this oil has a strong woody, earthy and musky scent. Product Abstract: Carrot is a domesticated form of the wild carrot, Daucus carota, which is native to Europe and southwestern Asia. It is a biennial plant which grows a rosette of leaves with an umbel of white flowers that produce the seeds. The name is derived from the Greek carotos, for 'healing'. The herb was transported to the Americas where it became known as Queen Anne's Lace, but the edible orange root as we know it was developed by the Dutch in the 1700's. Daucus carota / SD-R / Seed / Hungary, Austria Botanical Name: Daucus carota Main Constituents: Caratol: 76.37% Plant Part: Seeds Origin: Hungary, Austria Processing Method: Steam Distilled Description / Color / Consistency: It is a pale yellow to amber liquid with a thin viscosity. Aromatic Summary / Note / Strength of Aroma: A middle note with a medium aroma, this oil has a strong woody, earthy and musky scent. Blends With: Frankincense, Lavender, Rosewood, Cypress, and Geranium. Product Abstract: Carrot is a domesticated form of the wild carrot, Daucus carota, which is native to Europe and southwestern Asia. 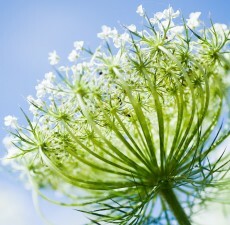 It is a biennial plant which grows a rosette of leaves with an umbel of white flowers that produce the seeds. The name is derived from the Greek carotos, for 'healing'. The herb was transported to the Americas where it became known as Queen Anne's Lace, but the edible orange root as we know it was developed by the Dutch in the 1700's. Cautions: Dilute before use; for external use only. May cause skin irritation in some individuals; a skin test is recommended prior to use. Contact with eyes should be avoided.